Google Gadgets or more specifically Google Universal Gadgets which are mini-applications that provide users with dynamic content that can be embedded in Web pages with functionality such as games, weather reports, calculators, currency converters, calendars, and etc, are now available for public use to embed on any websites or blogs. Dashboard widgets are similar to Google Gadgets except that it’s intended for Dashboard of Mac OS X Tiger operating system, while Google Universal Gadget is a web-page based widgets. In order to install and use the Google Gadget on Apple Mac OS X Tiger OS, Google Gadget has to be converted into a Dashboard widget, by using Amnesty Generator, a free utility from Mesa Dynamics. 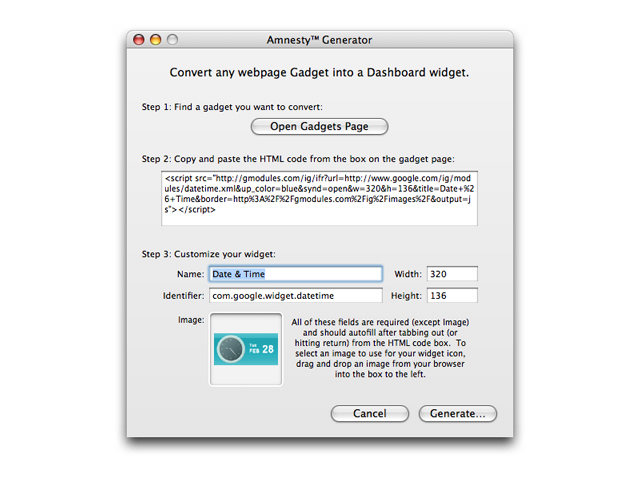 To use Amnesty Generator, download Amnesty Generator (AmnestyGenerator.dmg file for Mac OS X only) from mesadynamics.com (resource no longer available though source code is released to GitHub) and install it. Then search for web gadget from Google Gadgets For Your Webpage (Google Gadgets is deprecated) and click on “Add to your webpage”. Then, copy and paste the web gadget’s HTML code into the Amnesty Generator window, and click on “Generate…” button to get your Apple Dashboard widget converted and built. Optionally, you may configure and tweak some settings for the new widget such as width, height, name and etc. Once the widget that works with Mac OS X v10.4 Tiger’s Dashboard software is ready and generated, the widget can be installed into Apple’s Dashboard or Amnesty Widget Browser, or you can also convert the widget into a standalone OS X applications with Amnesty Singles.